POSH LATEST: A golden opportunity for Peterborough United to start a promotion push. Michael Bostwick is expected to play in the centre of defence for Posh against Fleetwood. Photo: Joe Dent/theposh.com. 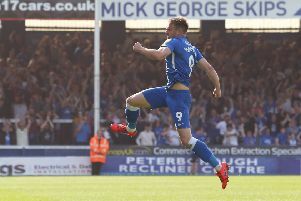 Peterborough United have a golden opportunity to gate-crash the League One promotion race before the end of November. The next three League One games for Graham Westley’s men are against teams currently in the bottom four. Posh host Fleetwood (21st in the League One table) on Saturday (November 14) before tackling Crewe (away, 24th, November 21) and Barnsley (home, 22nd, November 24). Posh also play away to mid-table Scunthorpe before the end of November. Posh, who are 13th, six points off a play-off place and 11 points behind the top two, have an excellent record against teams in the bottom half of the table. Only Rochdale have beaten them. But manager Westley said: “We can take nothing for granted. We all know anyone can beat anyone in League One. “But we’ve made steady progress since Grant McCann and myself took over and we have a good chance of making further progress this month if we play to our best. Posh are without central defender Gaby Zakuani and striker Souleymane Coulibaly against Fleetwood. They are on international duty with Michael Bostwick expected to deputise for Zakuani in the heart of the back four again. Centre-back Jack Baldwin starts a three-match suspension following his red card at Burton Albion last weekend (November 7). Full-back Kgosi Ntlhe is a long-term injury victim. Westley and Posh chairman Darragh MacAnthony will be answering questions at a fans’ forum at Ebeneezers Club, Woodston tonight (Thursday, November 12 from 7.30pm). All proceeds will go to the Chris Turner Statue Fund.